Behavioral Data: Coming in Hot! In Millward Brown Digital’s 2nd annual Getting Digital Right study, over 400 marketers from a variety of brands, media companies, and agencies were surveyed to find out how to get digital right in 2015 and beyond. 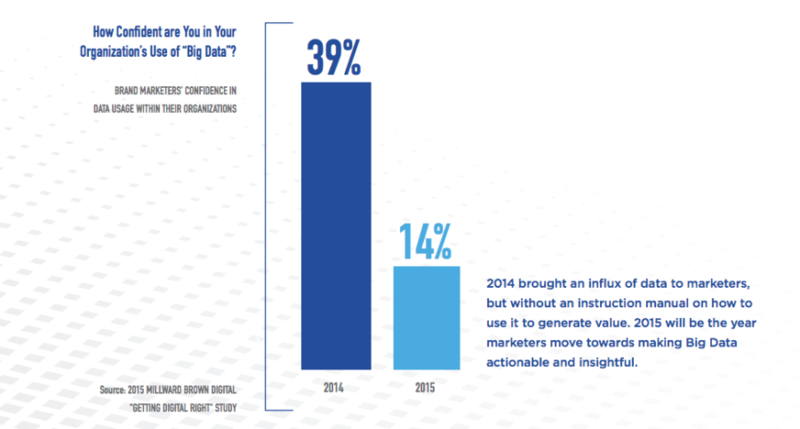 Whether it comes as any surprise or not, Transforming Big Data into Intelligent Decisions was voted as the #1 opportunity for marketers in 2015. Many companies can certainly claim that they are “rich” in data, but how many of those same companies have actionable strategies for leveraging that data? The answer, according to the survey, is shockingly low. In the graph above, we start to see the unsettling reality of big data. Despite what most people had envisioned, big data hasn’t been the solution to life’s problems, but rather the genesis of even more problems. Specifically, if you don’t know what to do with the data, then having a lot of it provides little to no value. On the contrary, finding ways to leverage your data in ways that make it actionable and insightful has extraordinary value, and there are already several companies starting to cash in. Although simple, this list can serve as a powerful tool to get your company moving towards a future where your data is truly solving prevelant business problems, rather than creating unnecessary ones. This article was syndicated from Business 2 Community: Behavioral Data: Coming in Hot!